An attractive looking rather round pear. Very crisp and juicy with a pleasant slightly acid flavour. Doyenne Boussoch is an old Belgian variety of unknown origin dating from before 1836. Intrduced into the UK in 1842. Was grown commercially during the 19th Century but later superceded by better varieties. 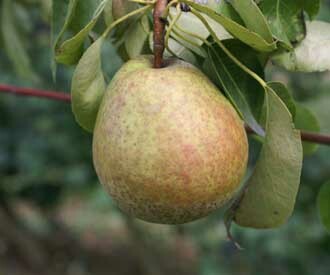 Medium to large round to pyriform fruit. Rough light green skin turning bright yellow. Occasional red flush. Little russetting. White, crisp, juicy flesh. Pleasant slightly acid flavour. Compact, spreading tree. Good reliable cropping.